The RNLI (Royal National Lifeboat Institution) are holding a Fish Supper campaign, where they’re encouraging people across the UK to cook up a fishy dish for family and friends to raise money for the crew members, who voluntarily have to sacrifice dinner time with their loved ones to respond to a shout and help those in trouble at sea. The RNLI do great work! To find out more about this campaign, which culminates this weekend, click over to their website. To give you some fishy inspiration, I’ve been given a delicious fish and tomato curry recipe from Hugh Fearnley-Whittingstall’s River Cottage Light & Easy to share with you. Fish curry may sound like an undertaking, but it can be fast because the fish itself cooks through in a matter of minutes. 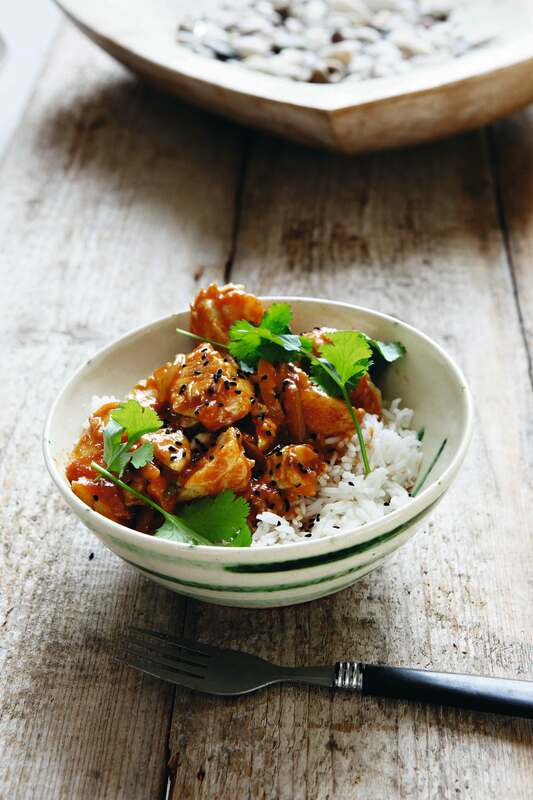 All you need to do is create a flavoursome, spicy sauce first, which is easy, as this dish demonstrates. Heat the oil in a large saucepan over a medium-low heat. Add the onion to the pan and cook, stirring regularly, for 8–10 minutes until soft. Now add the ginger, garlic, curry powder or paste and cinnamon stick, if using, and fry for a minute or two. Add the passata and coconut milk, the sugar, a pinch of salt and some pepper. Stir well and simmer, stirring from time to time, for about 10 minutes until rich and well blended. Meanwhile, check the fish for pin bones, prising out any you find with tweezers, then cut into large pieces, about 4cm square. Add these to the sauce, bring back to a very gentle simmer and cook for 4–6 minutes until the fish is just cooked through, stirring very carefully a couple of times (you don’t want to break up the fish if you can help it). Remember it will continue to cook after you have taken it off the heat. Stir in the lime juice, taste and add more salt or pepper if needed. Serve straight away with rice. Finish with a scattering of fresh coriander, and black onion seeds if you like. Doesn’t that sound so tasty! Why not get cooking this weekend and get involved with the RNLI Fish Supper.